It seems fitting to hear of a metal band coming from one of Britain's former steel-towns. Nowadays, Corby is more famous for Weetabix, the town's regeneration and a new rail station, rather than its previous skilled steel industry. A pity, because one of its more recent musical exports self-destructed at a time when much was expected of them. Raging Speedhorn were never likely to appear on T4 with a name like that, but their live reputation earned them sold-out shows and a notch on Britain's bedpost of rock. The nearest the band came to bothering the Sunday chart rundown on Radio 1 were a brace of minor hits in 2001 and 2001, the most promising of which was the suggestively-titled 'The Gush' (I'm presuming they didn't get the title from an infamous sketch from Chris Morris' TV-series Jam). The accompanying album, 'We Will Be Dead Tomorrow', languished at #67 for a week - and that was about it. Subsequent albums got even heavier including their 2007 swansong 'Before The Sea Was Built', culminating in the band's split in 2008. 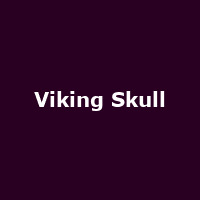 Cue Viking Skull. Originally intended as a spoof support act for Raging Speedhorn in and around the Northamptonshire area, the band has slowly grown into a fully-fledged paid-up Brit-metal band of some repute. Despite a few wobbles along the way (a missed opportunity to support Alice Cooper and a near-split in 2006), Viking Skull have got their proverbials in gear, toured with Cooper (finally), Sum 41, Dio etc and issued more albums than their predecessors, the latest of which is 'Cursed by the Sword', due for release in May 2012. On 28th April, you can join the band for a special hometown live show and video shoot at Corby Rugby Club (£5, selling fast). But we suspect you'd rather catch them live on the road. Luckily you can - Viking Skull are promoting the new album from 23rd May onwards, starting in London and followed by Cardiff, Plymouth and a handful more until Glasgow on 31st May. Tickets cost a tenner or less and are expected to shift pretty quickly! NB - Newcastle's show on 27th May is on sale from midday on Saturday 7th April.